Now Is Perfect Time To Get it Done! 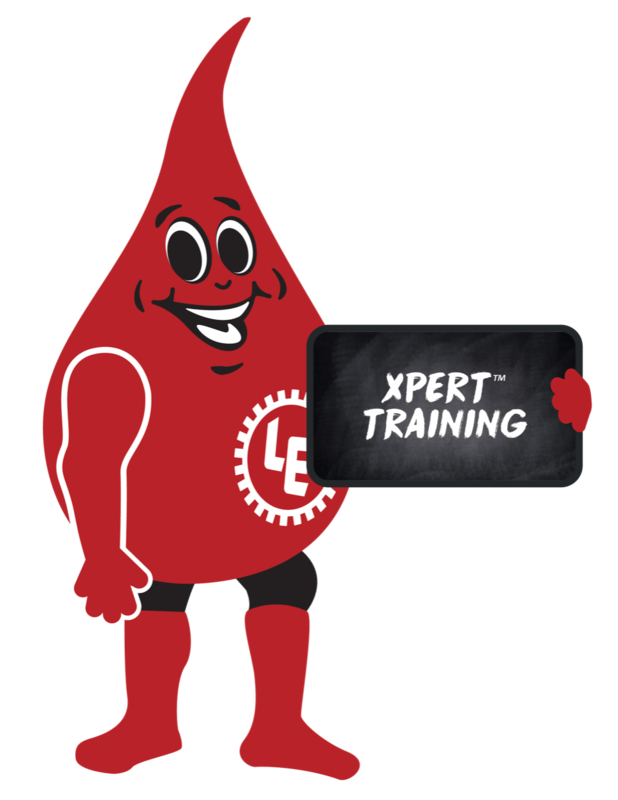 Our Xpert™ training classes are available at our training facility in Wichita, Kan., where proximity to our manufacturing plant and lab allows the incorporation of hands-on training, or we can schedule private training at your site. Current offerings include MLT I, CLS and OMA. LUBETOOL produces ﬁner machining ﬁnishes as well as extended tool life for reduced maintenance in the metal cutting process. Systems also deliver controlled oil feeds for improved lubrication situations. LUBETOOL’s individual positive displacement injector’s discharge closely controlled ﬂuid for atomization at jet tips for pinpoint delivery. Single and multiple outlet models are available. An effective precision lubrication management program turns on Reliability-Centered Maintenance or RCM, a process to ensure that critical assets function at peak performance regardless of the harsh environmental conditions in which they run. We offer automatic lubrication systems, centralised grease lubrication system, automatic grease lubrication system, auto lube systems for wheel loaders, auto lube systems for heavy equipment, auto lube systems for trucks, and components for all manufacturing, transportation, maintenance, and industrial applications. Complete systems and individual components available. Click here to review the impact of lubricants on your maintenance budget. Click on the images to learn more about what we can do for you. 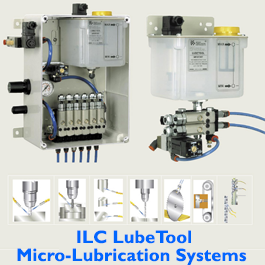 Lubrication Technologies offers ILC (Centralized Lubrication Systems) products and is the sole distributor in the US. What are the benefits of using an ILC (Centralized Lubrication Systems) Series Progressive System? 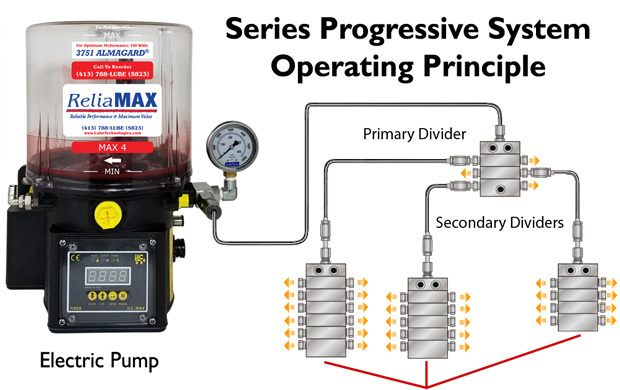 A series progressive system meters lubricant to each and every lubrication point sequentially, one after another. Any blockage of a tubing run serving a lubrication point causes the divider valve to stop functioning. Multilne systems or injector systems cannot provide any notification of a blocked point. There is a visual confirmation of lubricant flow through the divider via a pin that oscillates as lubricant is being pumped. 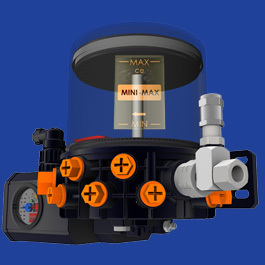 An optional proximity switch can be fitted to the valve which is then connected to a dedicated M12 connector on the pump. 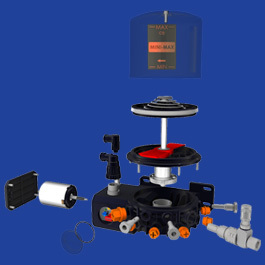 In the event of a blockage, the proximity switch notifies the pump of a lubricant flow issue and the pump would show a fault condition on the controller. The fault output may be used to illuminate a light or other warning device in the operator’s cab. 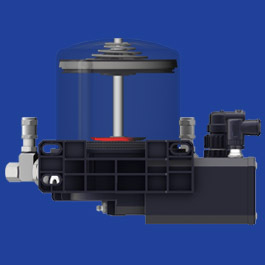 Every pump is equipped with an integrated low level switch. A low level condition illuminates a light on the pump controller and an output signal may be used to make an operator aware of a low level condition in the cab. The divider valve configuration is the only system design that allows greasing of all lubrication points in the event of a pump issue. The pump is capable of pumping NLGI # 2 grade grease. It has a fairly large inlet which we use to affix a cam lock arrangement allowing personnel to refill the pump with a manual pail pump. Every pump is equipped with a pressure gauge that provides real time monitoring of the system lubricant delivery. 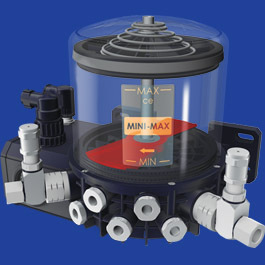 In addition the pump has a paddle that rotates and visually confirms its operation. As the paddle rotates, the pumping element, which is mechanically coupled to a cam, meters lubricant at a precise volume of .16 cc per revolution. Most competitive lubrication system pumps have controllers that allows the selection of a specific run time as well as a dwell time; the time the pump is in idle mode. 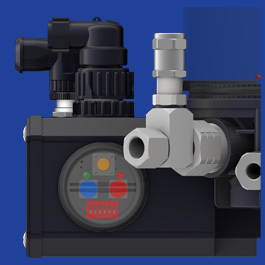 The ILC pump has a unique ability to be programmed to run for a specific number of pump rotations as opposed to run time. Run time programming does not factor in the wide variation in revolutions a pump will make per minute based on the ambient temperature. Effectively a pump programmed to run for 2 minutes at 20ºF will makes less revolutions than at 85ºF. In practice, this effects delivery volume. We Install Anywhere in New England! Mobile, Efficient, No Hassle Installations! If you can't come to us, No Worries, We will come to YOU! OK, SO WHY LUBRICATION TECHNOLOGIES? Our Lubrication Technical Consultants will partner with you to assess every lubricated component in your plant or fleet to measure current results and identify areas that are costing you time and money. Whether you choose to survey the entire operation or just focus on a few areas, you'll be able to compare the before to the after. We have over 40 years in the business of designing and implementing Lubrication Management programs that will extend equipment life, improve equipment reliability and significantly reduce operating costs. 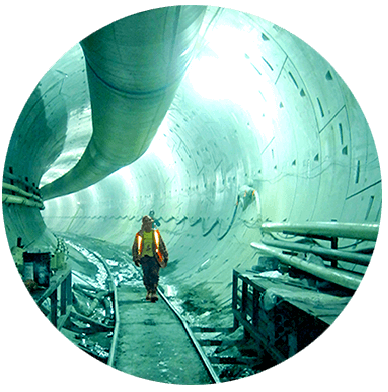 Our focus is the protection of your assets at the lowest life-cycle cost with 360° solutions. Using the metrics identified in the survey phase and considering the lubricant requirements necessary to increase equipment reliability and reduce downtime, our team will work with you to design and carry out a clear, concise, cost-effective Lubrication Management Program. New lubrication systems to meet the needs of all industrial, mobile, railway, wind power and marine applications. The result is a broad offering of lubricators from simple manual models to complex, fully automated and centralized oil or grease systems. We have over 40 years in the business of designing and implementing Lubrication Management programs that will extend equipment life, improve equipment reliability and significantly reduce operating costs. It is critical to ensure a top performance installation of lube systems. We began in 1976 as an authorized manufacturer’s representative for Lubrication Engineers, Inc. a full line ISO 9000 certified manufacturer of premium performance lubricants designed to maximize equipment life and improve productivity and profitability in all types of industries. These products, and a significant following of loyal customers became the foundation and remain the core of our operation today.. 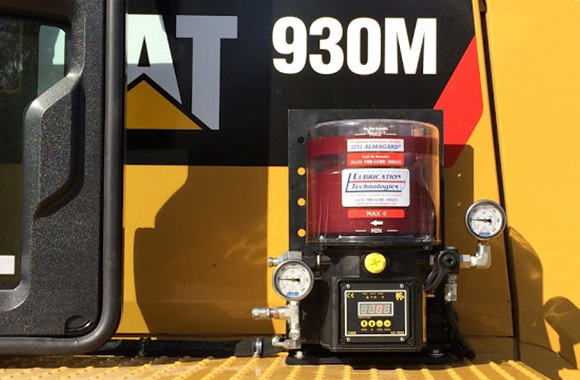 In 1992 we added automatic lubrication systems to our offering and over time brought in a distinguished selection of related products and services designed to add value and enhance our customer’s operations. It is critical to ensure a top performance installation of lube systems. We now offer total Lubrication Management Solutions making us truly a “one stop shop” for any and all lubricant related products. We believe there is no company with the exclusive product mix we offer and no other company with the commitment to service and responsiveness that we have become recognized for. 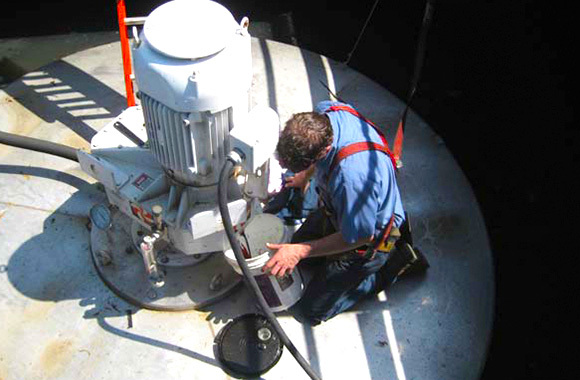 It is critical to ensure a top performance installation of lube systems. Our World Class Lubrication Reliability Programs provide measurable results to those who think in terms of Total Cost of Ownership. We pride ourselves on providing technically accurate and practical recommendations on our premium lubricants, rapid customer response, custom designed solutions and professional on-site turnkey system installations. 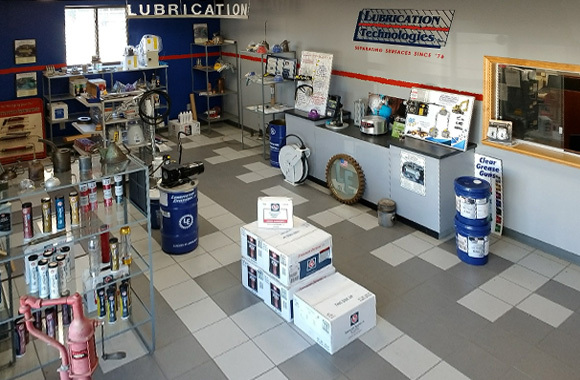 We keep an extensive selection of lubricants, lubrication equipment, systems and fittings in our shop. We try to exceed customer expectations by doing the right thing all of the time and treating our customer's equipment like it is our own. That is how we have built an extensive and impressive customer base across industries, satisfying one customer at a time. Today we enjoy the full confidence of our many clients who rely on us for all of their lubrication needs. It is critical to ensure a top performance installation of lube systems. Whether it's a new tri-axle dump truck, a multi-million dollar co-extrusion line, an entire paper machine, an 8 color press, a waste water treatment plant or a favorite boat, bike, or truck, we can help when it comes to maximizing equipment life and achieving performance levels rarely seen with other vendors. We are vested in providing superior service & reducing costs. We act as a consultant to you, our client, and are driven by results, not profits.